Japan Has Half Of Asia's Golf Courses, But The Game's Popularity There Is Flagging : Parallels In the 1980s, Japan built thousands of golf courses and the game became baked into its business culture. Those days are over. Golf participation in Japan has dropped by 40 percent since 1996. 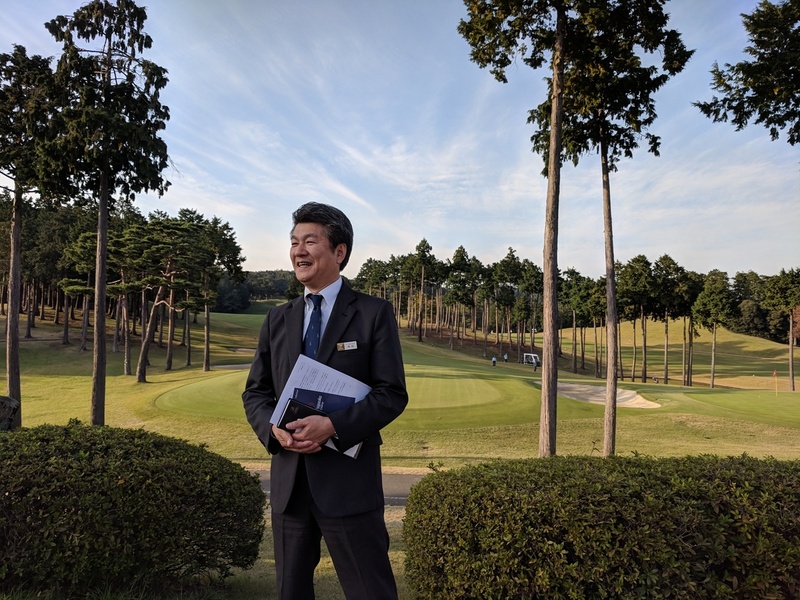 Takashi Yanaoka, president of the Musashigaoka Golf Course outside Tokyo, says tee times are booked at about 90 percent here. But it bucks an industry-wide downward trend. Golf has played an outsize role in the relationship between the U.S. and Japan lately, as diplomacy between President Trump and Japanese Prime Minister Shinzo Abe often includes playing 18 holes together. But in Japan, where you can find half of all the golf courses in Asia, the industry is flagging. America still has the largest golf industry in the world, by a long shot. But in Japan's economic heyday in the 1980s, it built up thousands of courses and the game became baked into its business culture. 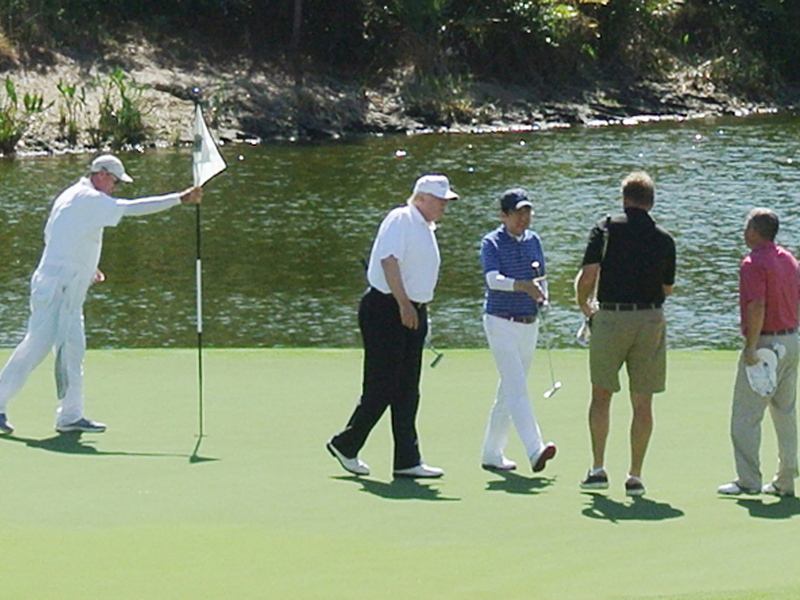 President Trump and Japan's Prime Minister Shinzo Abe played golf in Florida in February. Those days are over. Golf participation in Japan — a measure of the number of people nationwide who play golf — has dropped by 40 percent since 1996, according to the Tokyo Shimbun newspaper. Private courses — which make up about 90 percent of Japan's courses — are starting to disappear. They require hefty membership and initiation fees. Back in the 1980s, when golf was booming, Japanese clubs regularly required a deposit of $400,000 or more for a membership, according to industry analysts at Rakuten, the Japanese Internet giant. The deposit was supposed to be returned after a decade. But when the Japanese economy went bust after 1989, many private golf courses were unable to honor their commitment. Since then, dozens of courses have been bought out; others have been redeveloped, and some have closed down entirely. "They're just abandoned," says Tomita Shoko, who covers the golf industry for the Tokyo Kezai, Japan's oldest business magazine. Not only did the membership model falter, she says, but the old business culture changed, too. The turn at the Musashigaoka Golf Course north of Tokyo. During the Japanese economic bubble, it was very common for companies to do what they called seitai golfu — golf as informal business negotiations, Shoko says. "But when the bubble burst in '89 and the Japanese economy did not recover, businesses decided it wasn't worth spending the money on that kind of golfing," Shoko says, "and it hurt the golf industry overall." The industry is hoping it can attract another generation of players to keep its fortunes in the green. Golf is now back as an Olympic sport for the second time in the past 100 years — just in time for the 2020 Summer Games in Tokyo. Meanwhile, Japanese golf courses are trying various tactics to keep from closing. Because Japanese people are golfing less, many courses are trying to branch out to attract non-Japanese players — including tourists from other parts of the world. There's also a perception problem: It's seen as "your dad's" sport, leading to some trouble attracting younger golfers. 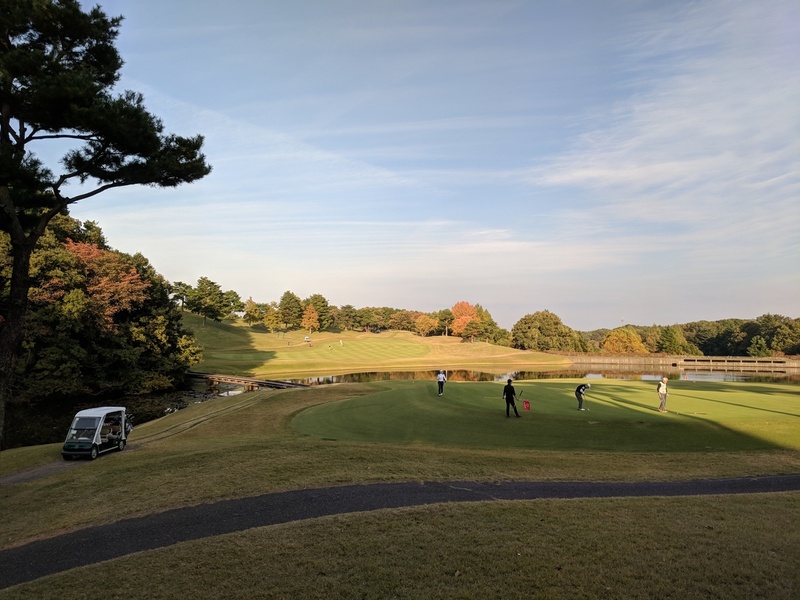 The Musashigaoka Golf Course, about an hour outside Tokyo, has managed to stay successful in part because it's a public course instead of a membership-only private club. And Musashigaoka is among many courses that are relaxing strict golf etiquette. It has loosened its rules on socks. Golf courses in Japan don't just require collared shirts for men and women, but blazers, too. Rules for timely play and behavior are tight. "There was a time in Japan when you had to have long socks to play. Men and women had to have long socks when they were playing on the course, if they were playing in shorts," says Takashi Yanaoka, president of the Musashigaoka course. "But those rules have relaxed and now people can have short socks." To stay relevant, some courses are now branding themselves as "American-style" — where players can wear whatever they want or linger on the greens. Yanaoka says his course hasn't gone quite that far. "When I think about people showing up on the course in a tank top and sandals, I'm just not sure that's how we roll in Japan," Yanaoka says. "If you really want to wear sandals and a tank top, go surfing." NPR producer Becky Sullivan and Tokyo journalist Jake Adelstein contributed to this story.